Whether it is the perfect travel grill or an all-in-one outdoor grill, Primo is the name that gets it done. Embers Living offers Primo Products like the Primo Ceramic Grills JR 200 All-in-One. This grill comes with a heavy duty stand designed for the outdoors, two side shelves, an ash tool and grate lifter, everything you need to use and maintain this grill. 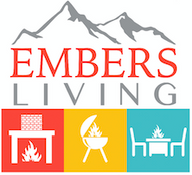 Check out the selection of durable and versatile grills from Primo on Embers Living and find the one for you today!